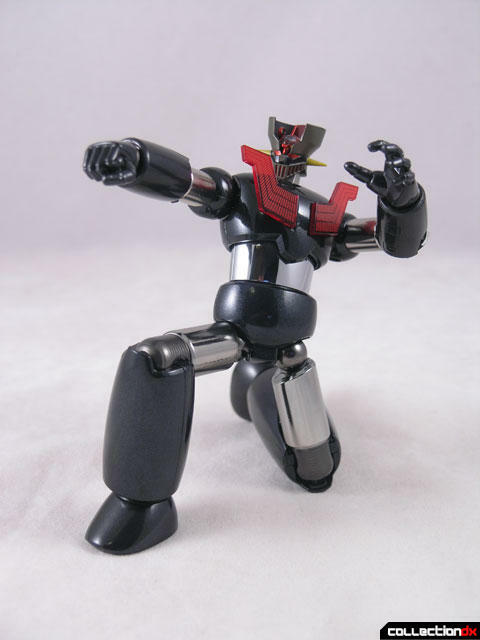 This Soul of Chogokin was an exclusive release for the Autumn 2009 Tamashii Nations Expo. 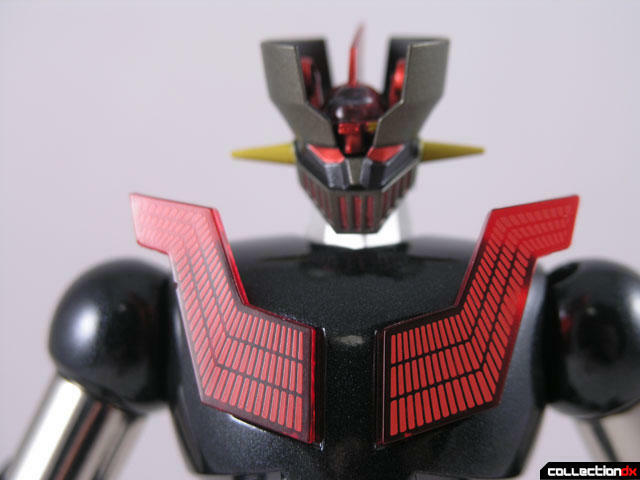 It shares the same body as the GX-45 Mazinger Z, so I am not going to go over again how great it is. If you don't have one, pick it up. it's great. But if you do have one, and you want another, slightly more evil version, this is the one for you. 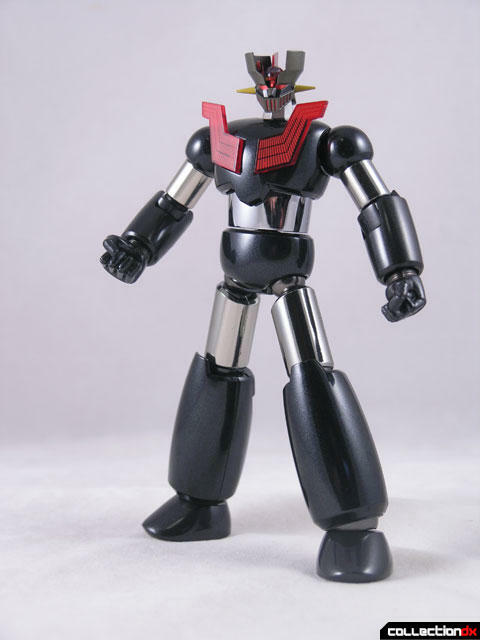 Released in limited numbers at the Autumn 2009 Tamashii Expo, the GX-45A Mazinger Z Atami Night version is a darker take on the classic hero. 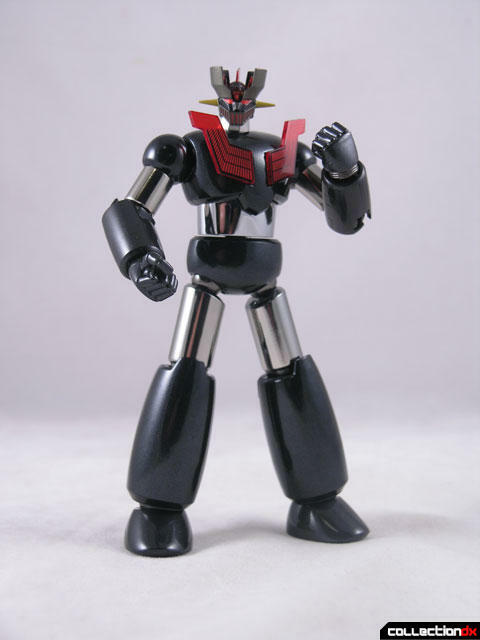 I have not yet seen the new Mazinger TV series, and I should be flogged for it. 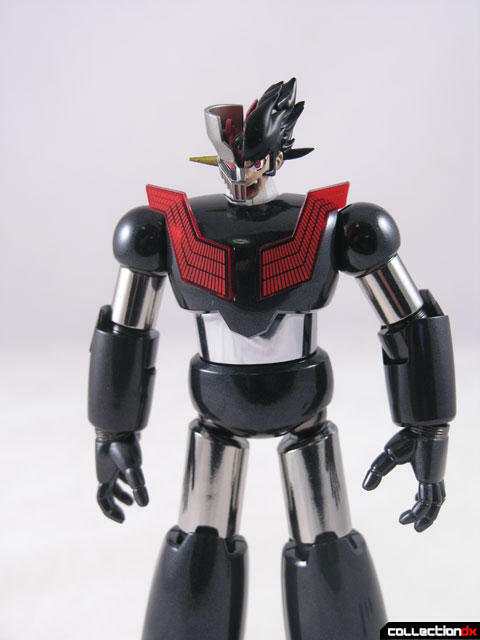 I have no idea if this version of Mazinger appears in the show or not. The box is rather bland and nondescript. Thus is the nature of these "night" versions. It does the job, and it makes it less toy-lke. The deal with this one is that you have a completely different finish than the other version. 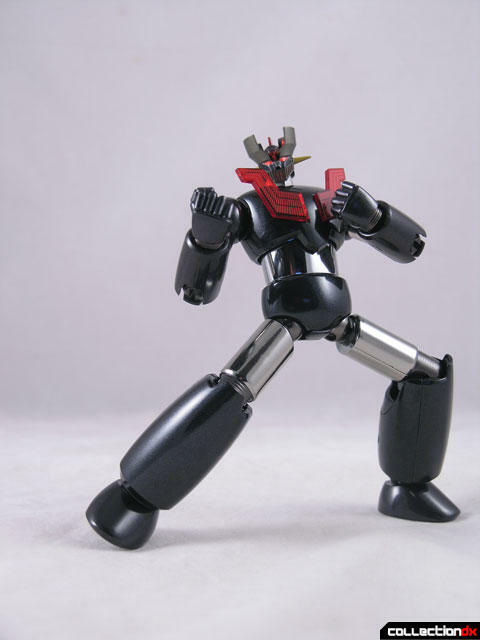 This time you get a metallic black finish with shiny chrome limbs. Maz's head is darker, with red eyes and red highlighting on the grill. 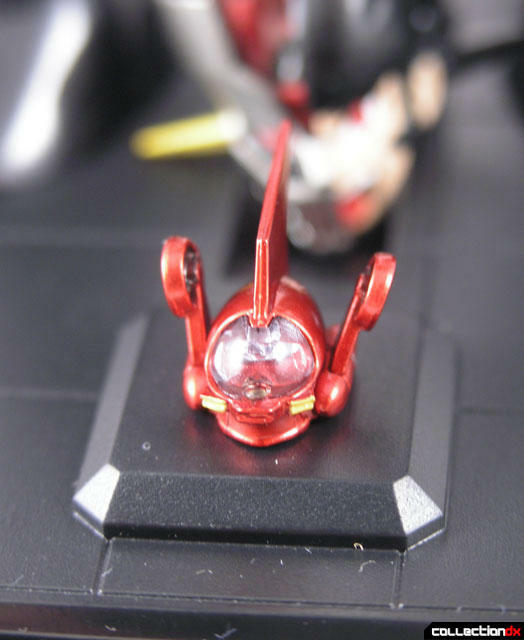 The Hover Pilder is the same, aside from a darker red metallic coloring. It still fits loosely on the head. 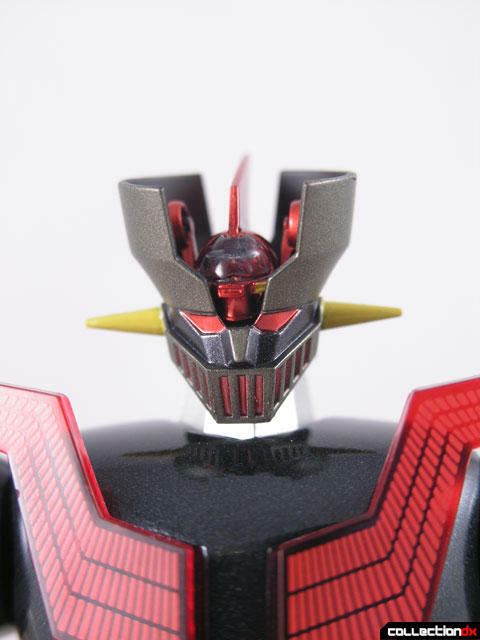 This version comes with an alternate head, one that is half Mazinger, Half Koji Kabuto. I can see this emulating one of those anime split-screen effects, but like I said, I haven't seen it yet. The only other difference is the translucent chest plates. These are really spectacular. 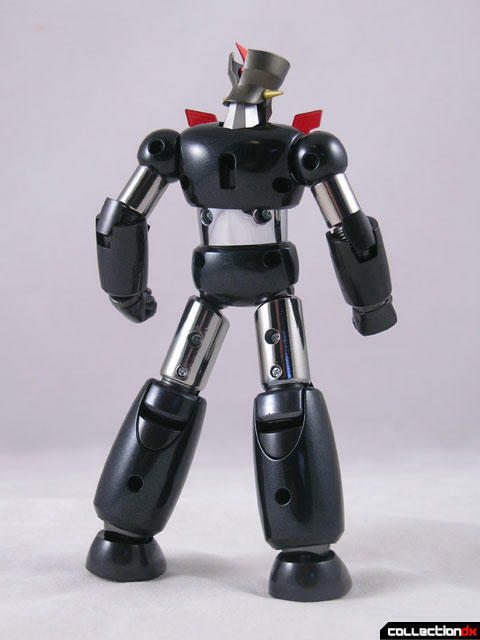 The other accessories included are the standard set of open and closed hands, arm launching attachments and launching arms. Not included with this set is the scrander wing. The stand is the same as the GX-45. It's a really great looking figure, and I think a repaint that you should pursue. However, being a convention exclusive makes it hard to come by. 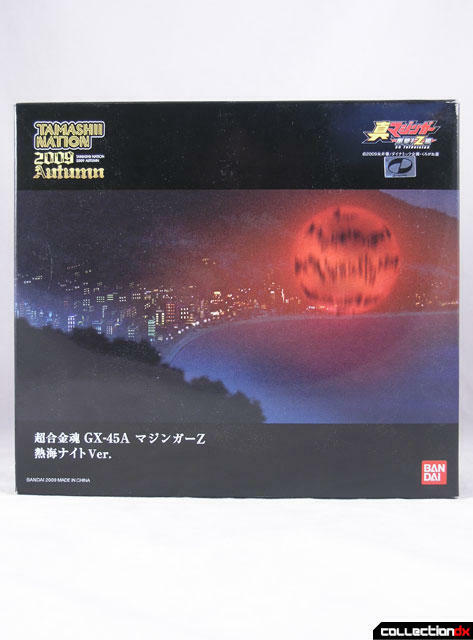 Fortunately Anime-Export.com seems to get their hands on Tamashii Nations exclusives in record time. Yes you will have to pay a premium for them, but in this case, I think it is worth having. It's a pretty awesome variant we're kinda spoiled for choice with this mold now. I'm just planning on grabbing the GX-49 myself. I'll look forward to a reveiw. 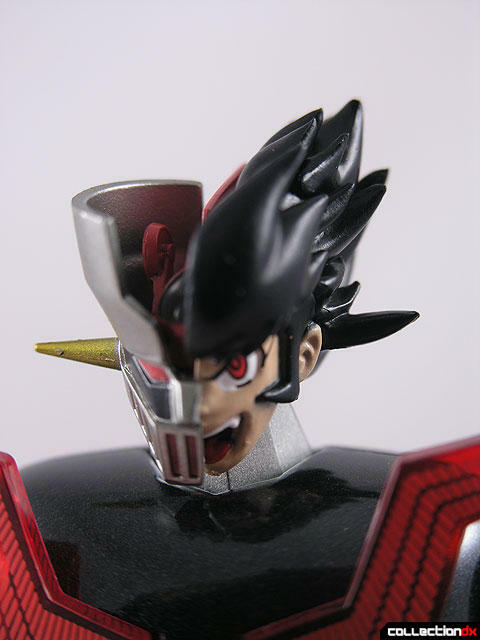 Imagawa seems to have at thing for placing the pilots head on the robot during epic battle moments, it happened a few times in G Gundam too. Humanity calls out to me, Kamen Rider Stronger, etc. 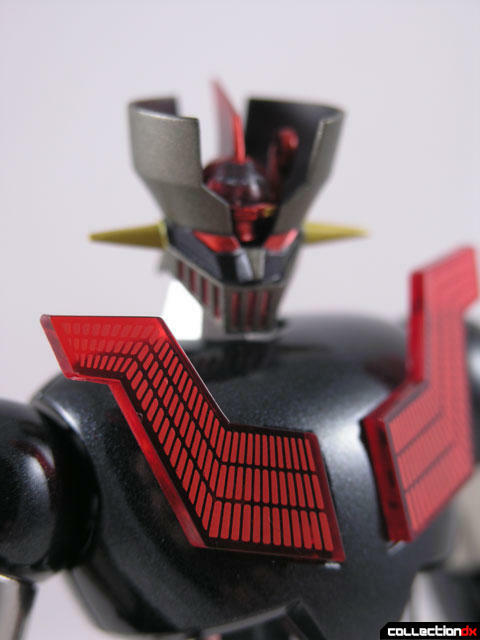 "This version" of Mazinger is the regular Mazinger; only viewed at night! As far as recolors go, this is pretty nice. I need to watch the anime as well. So I should be flogged for this, too. 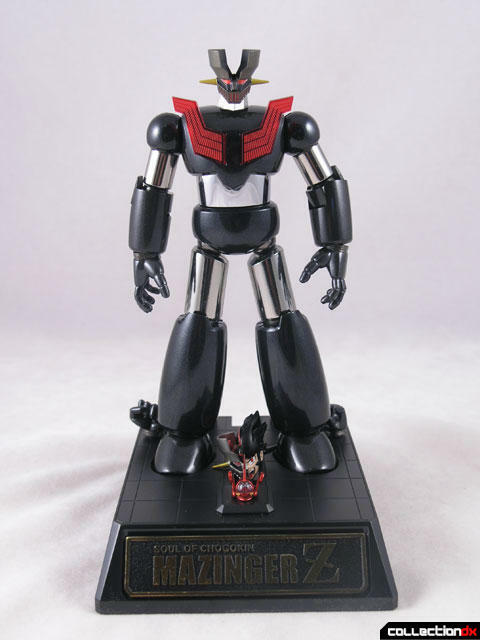 The diecast is pretty cool and quite expensive at 13,500 Yen (almost double the price of the GX-45). However, there is one thing that really worries me, namely the name GX-45A. What does that A stand for? 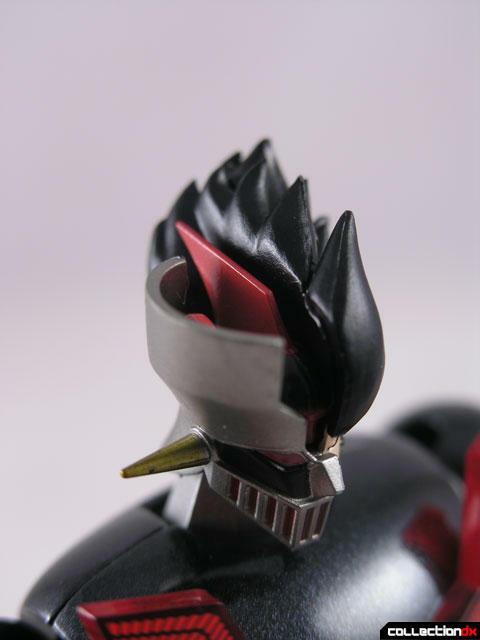 Will there be a B version with a jet scrander wing and then a C version with a scrander wing version that transforms into the atomic punch? Oh no, this time round I will definitely NOT fall into that trap again. I think the A stand for "Atami" in Atami Night". 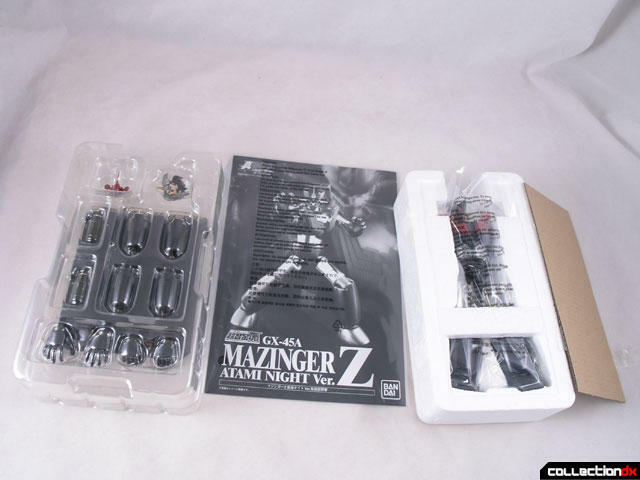 I asked what it was as there is no real image of Mazinger on the box, I just new it was BanDai and Tamashii. 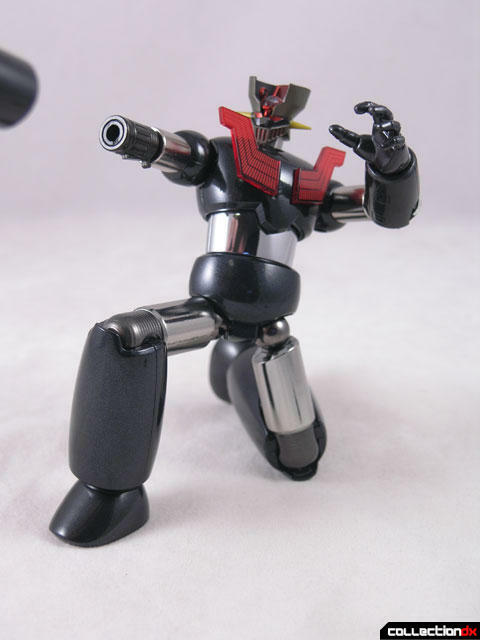 When the owner told me it was a new Mazinger... well yeah, I had to bite. As a repaint its really sleek and a worth while one. 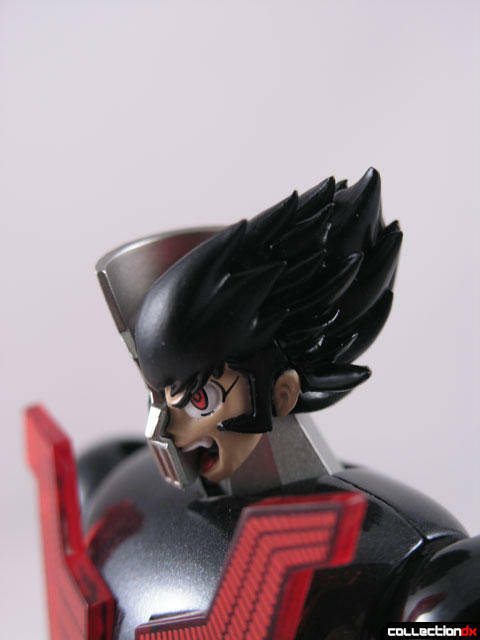 Metallic red eyes and hove pilder are really impressive. If your familiar with the regular GX-45 then you know this is great build quality. The dark metallic grey body paint is gorgeous and has real depth just like a high end automotive paint job. I'd trade that alternate head in for jet scrander for sure though. But it still looks great, next to the GX-45 with his on. Most impressive!